As part of events to mark its tenth anniversary, an interactive session with his Excellency, the Bishop and Arch Bishop of Enugu (Anglican Communion),Most Rev. Dr.Emmanuel Olisa Chukwuma (OON),under the theme “What we expect from a Nigerian University: The Pursuit of Excellence”, took place on the 20th March,2019 at the Goodluck Ebele Johnathan Convocation Arena. Expressing his pleasure at being called upon to address members of the institution, the Bishop congratulates the university on its tremendous growth since its inception. In his address, with his usual confidence and undeniable charisma, the Bishop first breaks into a song much to the delight of the audience, urging the crowd to join in, as enthusiastic students begin to chant, “If you believe and I believe Nigeria shall be saved…” and so it goes till the end, rousing a thunderous applause. The Bishop ultimately proceeds to make an allusion to the spirit of ecumenism, which he insists is imperative in attaining excellence, stressing that the pursuit of excellence is an onerous and materially expensive task which would take diligent, consistent and dedicated work over time to achieve. The Bishop gives examples of the world’s top class universities, and challenges the university to recognize that excellence is not achieved over night, and therefore must be inspired rather than discouraged. He further explains why excellence is obligatory and ways to achieve it over time. Citing internal and external factors that under the achievement of excellence in Nigerian universities, such as inadequate funding, ill-trained and mediocre staff, extreme materialism among others, the Bishop dares Godfrey Okoye University to be different in this regard. 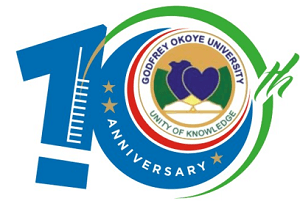 In the case of Godfrey Okoye University, the Bishop first charges the university to acknowledge the providence of God as it engages in its day-to-day quest for excellence. He then proceeds to offer suggestions on how to successfully navigate through the adapted roadmap. To conclude his address, the Bishop emphasizes the need for commitment from all stakeholders. He also admonishes the university to be guided in its quest for excellence by the words of Apostle Paul’s exhortation in Phil 4: 8 and to commit the tasking but worthy mission of attaining excellence into God’s care. The Vice Chancellor, Rev. Father Christian Anieke, in his closing remarks, thanks the Bishop for re-emphasizing his insistence on excellence among staff and students. He also thanks the Bishop for his contributions in the field of education and human life. Finally, in his vote of thanks, the Registrar, Godfrey Okoye University, Dr.Nnamdi N.S. Ene, on behalf of the senate and entire university also expresses gratitude to the Bishop for finding time, despite his busy schedule, to be present at the university. After the closing remarks, a closing prayer said by Rev. Father Ikechukwu Ani brings the session to an end.